Our open house produced good discussions and many suggestions. LAST WEEK, we held an open house at the College of Eastern Utah to discuss deer management. We had a good turnout. Eighty-one people registered, and we had some additional visitors who just wandered in to share their ideas. People began showing up about 6 p.m., so we started a little early. Many expected a presentation and said they just came to listen. This is the major difference between an open house and our traditional regional advisory council (RAC) meetings. At open houses, we set up clipboards, listen to suggestions and record the comments of those who come. The priority is to listen to the suggestions and concerns of those who attend, rather than to make a presentation. We held the open house in the ballroom of the Jennifer Leavitt Student Center, so there was plenty of room for visitors to browse the displays and talk to DWR employees. From the comments we got, attendees were pleasantly surprised. Most expected a confrontational meeting. Many said they were happy they got to express their views. They appreciated the opportunity to speak one-on-one with a biologist and to share ideas. They were surprised that the biologists were open to their suggestions. Here’s how it worked: attendees signed in at the front table, where a greeter asked about the issues they were interested in. The greeter then directed our visitors to one of nine tables. We had stations to discuss habitat restoration, highway mortality, general questions, deer management, predator management, law enforcement, and how the public-input process works. We also had a table for habitat enhancement on private lands, but, still that is only eight. Oh, the ninth table was for the refreshments. At the tables, biologists and conservation officers answered questions and listened to suggestions, which were recorded. In many cases, suggestions from one person prompted a discussion among those listening. 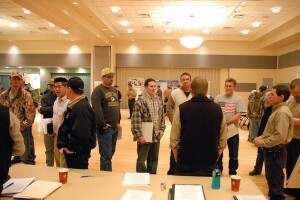 The beauty of the system was that people interested in deer management in Utah were able to discuss their ideas with each other in a positive manner. Although there were a lot of divergent ideas, we found many places where we can agree. All agree that something needs to be done and that we need to work together to do it. Visitors shared their ideas and concerns about Utah's deer herds. So, why did we hold this meeting? Last November, we held RAC meetings in all five regions to discuss a major change in Utah’s deer management. These meetings culminated in the Utah Wildlife Board’s decision to implement a unit-by-unit deer management system. The RAC process was very confrontational. At one point in our RAC meeting, I turned to a good friend, and stated, “Wow, there is a lot of energy in this room! There are a lot of sportsmen here who really care about deer. It is a shame we cannot harness all of this energy and work together and get something done.” Now, I usually don’t speak quite like that, but you get the idea. My friend represented one of the major conservation groups. He was there to support a recommendation different than the one offered by the Division, yet, he agreed. He reminded me that he has always helped in any way we asked, and that is true. He has always answered the call whenever I have asked. His only desire is to recover the deer herds. On that, we agreed. Our division director, Jim Karpowitz, has emphasized the need for us to listen to our constituents, build trust with them, and work together to solve this problem. He asked us to hold these open house meetings. This past week, I returned to my roots for a day. I went back to Canyonlands National Park where I studied desert bighorn sheep to earn my master’s degree. That was a great project. I decided to take a hike and go look for some sheep. A short distance up the canyon, I diverted and went up a ridge. I was trying to get to a high point to glass for bighorn. Well, I ran into a pour-off and ended up scrambling over some boulders to get past it. At one point, I had to place my foot on a tiny crease in a rock and steady myself before dropping ten feet or so to the ground. As I got ready to jump, the whole side of the hill seemed to slip. Rocks and sand slid downwards, smattering against the cliffs, and red dust filled the air. With a leap of faith, I let go and somehow landed without injury. As I walked on, I was impressed how this hike was similar to our need for public input. How could I have avoided this tense situation? Well, if someone taller than me was along, maybe they would have seen the danger. Maybe someone else had been there before and wrote a book, warning others. Someone else could have taken a higher route, etc. The point is, none of us can see everything. We all have different perspectives. To be successful, we must be persistent and continue to persevere and work hard, if we are on the right course. How do we know we are on the right course? I suggest it is by discussing difficult issues openly with those with differing views. Open, honest discussion provides opportunity for the truth to be heard. If it is heard, it can be acted upon. A group of attendees discusses deer management with DWR biologists. So what new suggestions came up in our open house? There were a few. One person suggested that all hunters be required to buy a license every year, but only allowed to harvest one buck every five years. Someone else added that we should give youth hunters a two-year waiting period, so that they don’t lose interest. Others suggested ways to encourage removal of coyotes. Almost everyone supported continued habitat restoration and vigilant enforcement of hunting and off-road vehicle rules. One idea we will seriously consider is to split the San Rafael unit from the Manti in the new deer hunting strategy. All in all, we received over four typewritten pages of suggestions. Each one will be evaluated. We will work those we can into our recommendations in the future. I would like to personally thank all who took time to come. We appreciate your efforts and concern for Utah’s deer herds. I attended the Open House and was pleasantly surprised. I thought it might be a complaint session. Turns out it was an exchange of ideas between the DWR and the public. Most of the people I talked to were content that their ideas were listened to and welcome. 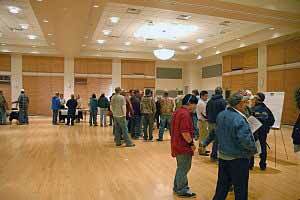 The DWR people were pleased to know the public got a better understanding of what they were trying to accomplish. Both sides look forward to meeting again and discussing some of the new ideas. All in all I think it is a move it the right direction for the DWR. Good job. Great meeting and wonderful format. We appreciated the how open the division was to comments and questions. 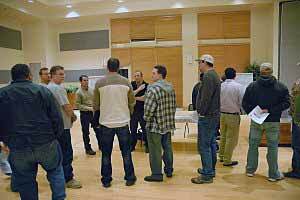 We also enjoyed speaking with other sprotsmen and exchanging thoughts and ideas. Keep up the good work and we hope to attend more of these types of meetings in the future. Nice article Bill. Hopefully the DWR will continue to educate the public, and offer more constructive meetings like this. The public has a right to be heard and included. Everyone interested and involved really needs to keep an open mind and try to work together. The talk outside the meeting was positive. You want to see what it truley happening to the deer herd and do something about it. I can give you a great place to start. Get with the US forest service, and go up on the so called “PUBLIC” lands or national forests, and count how many sheep and cattle there is on those lands. Count the head of cow you see, and sheep, and then, if you can even find a deer or elk, count them as well. I bet you will need a counter to keep track of the livestock, and you will be able to count the other animals on one hand. I know there is animlas there, but all these other animals are driving the deer out of palces they drop thier young, they are driving them out while they are supposed to be hid up after they are born, and they are grazing through everything that the deer are tryig to get to. I know there is a lot of people that will say I am crazy, but I also know there is a reason the USForest service allow this to happen, $ of course, and they make a lot, but what is it going to take to get the livestock off the mountains that are supposed ot belong to everyone. Why do I have ot walk around in cow pies just to go camping, because there is not a place to cap in “OUR” mountians without ahving them covering the whole place. I am sick of going for a drive to enjoy the mountains, only to be sikened at the amount of cattle and sheep I see and how few deer and elk there is anymore. When I was a kid, I could go into the mountains with the family, we may have seen a few cattle, maybe even a small heard of sheep, but we would see deer and elk and moose, and grouse, rabbits, and a ton of other critters. Now, all I see are bovines, and stupid sheep. This last year I have been all over the state, Duchesne, Sanpete, Utah, Sevier, Emery, Kane, and a bunch of others. I have been in national forests, DNR lands, Public lands, just about every kind of land, and all open to Public use, but all I see is cattle, and sheep. All over the place. From mountain tops to valley floors. Cattle and domestic sheep are not more important than our wildlife. Get the animals off the PEOPLEs lands and make the cows stay on the ranchers lands. Let them take care of thier oun animals. OH, another thing, I have actually heard ranchers talk about “Killing all those damn deer and elk, to make room for more cattle or sheep” Something I think is absolutly and totally deplorable. I have heard them talking about it and how addimately they seek out ways to “take care of” our wildlife, like castrating fawns they find in the fields, and letting dogs attack the fawns, and just shooting deer when they see them. You may think this does not happen, But I know a whole mountain that had all the deer killed on it by one person, He was a cattle man and wanted all the land to himself. The mountain was West mountain on the west side of Utah lake. All the deer were hunted down and shot one by one and there was no deer on that area for years. Everyone says Predators are the reason the wildlife are decreasing in numbers, but anyone that knows and understands Preditor to prey ratios, know that predator numbers will follow the populations of the prey, If deer numbers are down, why are the predators not falling to match? because there is all that mutton and veil still around to keep numbers of predators up, and also making a deers life hard to live. Hmm, everything I have seen points to livestock creating an environment for mule deer to flourish earlier in the 20th century. It’s easy to trace mule deer population trends being in direct correlation to overgrazing and predator eradication from livestock affiliates. There are WAAAAY less cattle and sheep on the mountain than there were 30 years ago. Coincidentally, there were WAAAAAY more deer on the mountain then as well. Coincidence? Why isn’t the division conceding that mule deer are simply returning to historical numbers and being rebalanced after residing at an unnatural number for so many years due to predator eradication and irresponsible grazing practices? The misinformation that exists is absolutely mind boggling. I am a non resident hunter who has been hunting since 1978 without missing a season. I am glad that someone is looking at building up the deer heard in Utah. I believe that you have to many seasons and they can hunt year round. I spend a lot of time and money to hunt and the deer heard has really gone down in the past years. I wish i lived closer but Texas is a long way off or I would have been at that meeting. If we keep killing everything now then none of us will have a place to hunt. I know that it wont be in my life time but I would like to see it back like it was back in the 1960s. If you listen to the hunters and not the people who are in it for the money you can learn lots.